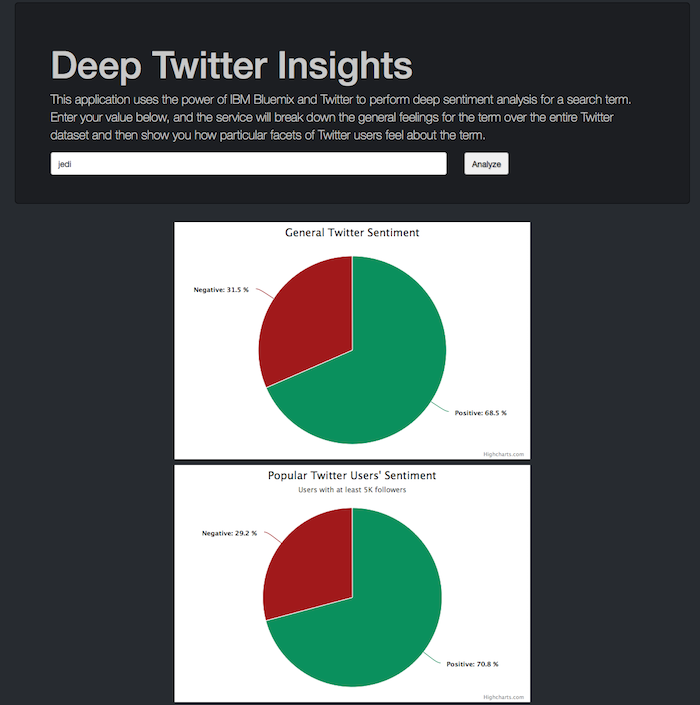 One of the more interesting services available on IBM Bluemix is Insights for Twitter. This service provides a deep look at real-time Twitter data. The API provides a basic “search” feature but can also include some incredibly detailed filters. So for example, you can look at data from users who are (possibly) married and have kids. As part of the analysis, you can also get a sentiment value: positive, negative, neutral, and ambivalent. I thought it would be interesting to build a tool that let me compare the “general” sentiment for a search term compared to that of more focused segments of the audience. Obviously this isn’t 100% accurate, but it provides an interesting look at how different types of people view/discuss the same topic. By people within a circular region around a long/lat. The docs explain how the API works including the query language. In general it is pretty simple, but the best news is that you can skip getting results and just use the count method instead. That means I can easily get sentiment analysis with 4 API calls (one for each sentiment). As an aside, I ended up not displaying all four sentiments in my charts, but the back end code still fetches them all. I’ll include a link to the code base below, but here is a snippet showing how I fetch the general sentiment for a term. The code in the forEach there is handling applying each HTTP result to a proper location in my main result object. Generally your array of results will match how they were applied to the array, but as I’m using 5 forEach statements for my reports, I can’t know for sure the order they will be added to the array. Kind of complex, but that’s all nicely hidden away in my library. Back in the main Node.js route that handles all of this, it is rather simple. So how about the front end? I decided to use Bootstrap to create a simple UI for the term searching. For my charts, I decided on Highcharts. It is free for commercial use and I liked the animation of the charts. Here’s a sample report. You can see all the code for this project on the GitHub repo I just set up: https://github.com/cfjedimaster/twitterinsights.